If you’ve ever felt that scribbling down a quick message for someone on a Post-it note was too cold or impersonal, Native Union’s new high-tech alternative is right up your alley. Instead of leaving just a quick “Call George” you can take advantage of its whopping 256MB of built-in memory and camera to record a video message up to 3 minutes in length. Or, multiple shorter messages. 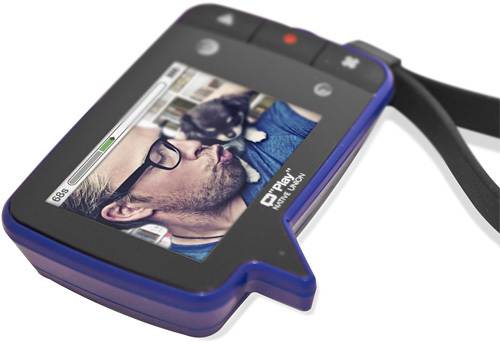 The videos can be ‘enjoyed’ on its 2.4 inch LCD display, and on a set of 3xAAA batteries you should be able to record up to 3 hours of video before it conks out. Instead of a sticky strip on the back, the Play is magnetic so it can be adhered to fridges, cabinets and far less places than a Post-it note. And since the name of the game is ‘fun’ here, when it’s available in about a month’s time for ~$80 (£49.99) you’ll be able to pick one up in your choice of green, pink, blue, purple, red, white or black. By Andrew Liszewski on 08/23/10 • Leave a comment! 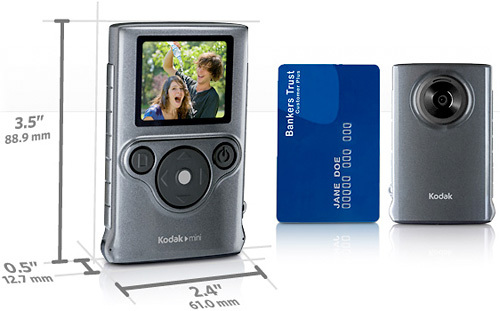 I don’t think anyone’s snickering behind the Flip’s back about it being too pudgy, but Kodak’s new uninspiringly named ‘Mini Video Camera’ certainly improves on the pocket-friendliness of these zoom-less camcorders. As you can see it’s really no bigger than a credit card, and even at 1/2 inch thick it’s remarkably svelte. But what you gain in petiteness you lose in functionality and capability since this little guy is only VGA 640×480 capable, for either videos or stills. It does support microSD cards though, giving you hours and hours of capture time with a 16GB card, and it’s waterproof making it still usable at the beach or during monsoon season. And with a price tag of just $99.95 the lack of even 720P ‘HD’ is almost forgivable. 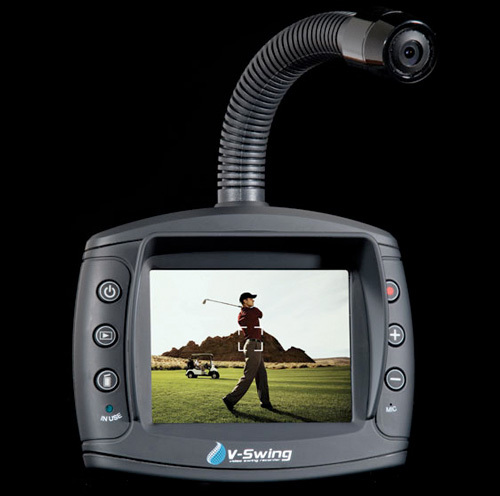 It doesn’t do much more than your average flash based camcorder, but the V-Swing does have a few features aimed at golfers looking to hone their game. The most obvious is the War Of The Worlds-esque gooseneck-mounted camera that can be bent in all directions and rotated up to 270 degrees. That coupled with a 170 degree wide angle lens means you should have no trouble capturing your swing with this thing mounted to your golf cart or bag. It’s also claimed to have high speed frame rate capabilities allowing you to step through and analyze your swing in slow motion, but a closer look at the specs shows it maxes out around 50fps. So I’m going to assume it’s got a fast electronic shutter to keep blurring to a minimum. The 60MB of built-in memory is essentially useless for doing any kind of video recording, so you’ll want to factor in the price of a large SDHC card if you intend to actually capture anything, but a 32GB card should hold up to 12 hours of 640×480 VGA video. The rechargeable lithium polymer battery is rated for 5+ hours, though I’m not sure if that’s with the 3.5-inch TFT LCD display turned on. However, it looks like Amazon is carrying it for $349.95, and at that price (and cheaper) you can pick up one of Casio’s EXILIM digital cameras that are capable of capturing up to 120fps at VGA resolutions, and even more if you don’t mind a drop in resolution. By Andrew Liszewski on 05/13/10 • Leave a comment! 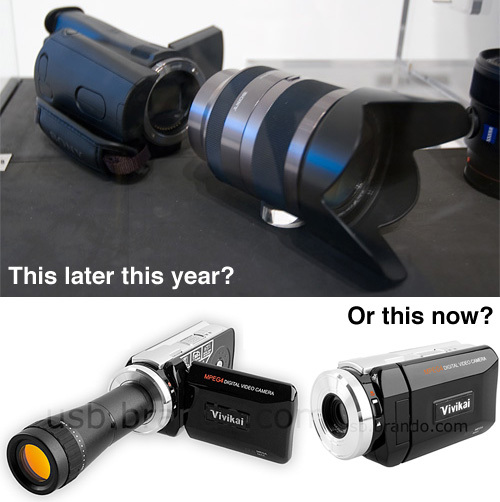 At Sony’s NEX-5 & 3 launch event on Tuesday the company also had a mockup camcorder, locked away under glass, that used their new E-mount camera lenses. It was an exciting prospect, but if I remember correctly the reps on hand said it wouldn’t be available until later in the year at the earliest. So if you can’t wait that long, this $99 camcorder from Brando kind of provides the same functionality, with a few trade-offs. Instead of capturing video at 1080P, it maxes out 640×480, and instead of being able to choose from a growing collection of E-mount lenses, you’re limited to either the cameras 7.45mm fixed lens, or the included telephoto add-on which provides 8x optical zoom. It’s also limited to only capturing video as MP4 files on an SD card, where as the Sony alternative will no doubt support AVCHD to SD or Memory Stick. 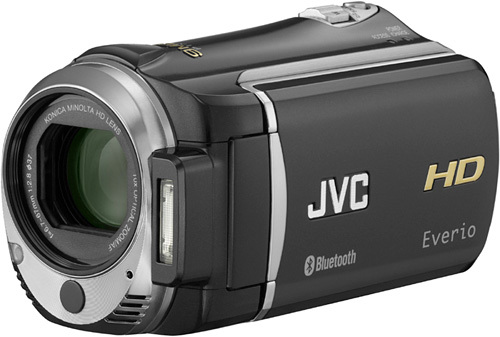 But again, the important thing is that this camcorder is available now! Junior’s not going to wait to take his first steps until Sony gets their version to the market. I’m not going to try to puzzle out whether or not the Muvi Atom is indeed, as it claims, the “world’s smallest digital camcorder.” At 2cm by 4cm by 1.5 cm, it’s damn small, and let’s just leave it at that. Despite its size, it manages a respectable 640 x 480 30 fps video capture, runs for an hour per charge (plug it in via micro-USB), and records onto microSD cards up to 8 gigs. It can be set up to be triggered by loud noises, and has a clip on the back that can attach it to a pocket or shoelaces. Wait, what? The Muvi Atom is currently available from Firebox for $99. Initially I wouldn’t have thought that adding Bluetooth capabilities to a video camera would be useful beyond maybe letting it talk to a GPS receiver so you could geotag videos and photos, but the new GZ-HM550 Everio from JVC can use it in more interesting ways. It allows you to use a smartphone as a wireless remote for example, which is one less accessory you have to carry, or monitor the audio with a pair of wireless Bluetooth headphones, which is also quite convenient. But Bluetooth isn’t the only thing the GZ-HM550 is packing. It’s a full HD digital camcorder (ie 1920×1080, not that 720 crap) with a 10.6 megapixel CMOS sensor that’s also able to snap 9 megapixel digital photos. The 32GB of built-in flash memory is good for recording about 3 hours of video at full HD quality, though that can be further expanded with the use of SDHC cards. A Kinoca Minolta lens provides 16x optical zoom without any loss in image quality, and built-in image stabilization will keep things from getting too shaky when you’re zoomed all the way in. With a price tag of $799.95 and a decidedly un-pocket-friendly form factor the GZ-HM550 definitely isn’t designed to compete with the Flip UltraHD, but that’s not necessarily a bad thing. By Shane McGlaun on 06/09/09 • Leave a comment! The first camcorder that I ever saw was one that my uncle had. The thing was huge and looked like something the newscasters used. It wasn’t only the huge camera though; the thing had a huge VCR that had to go along with it. It weighed about 30 pounds altogether. Panasonic has announced a couple new camcorders today that are being called the world’s lightest camcorders at 0.5 pounds. 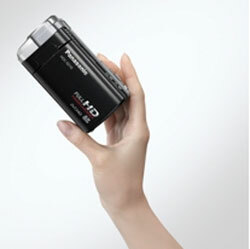 The camcorders are the HDC-TM10 and the HDC-SD10. The only real difference between the two is that the SD10 stores video to SD and SDHC cards only. The TM10 has 8GB of internal storage and then changes to SD/SDHC cards. By Shane McGlaun on 04/30/09 • Leave a comment! I for one am glad that the majority of consumer video cameras available today have left tapes behind and moved to digital storage formats. That means instead of having boxes of cassette tapes sitting around the house gathering dust I can put all my home movies onto my computer or burn the easily to DVD. 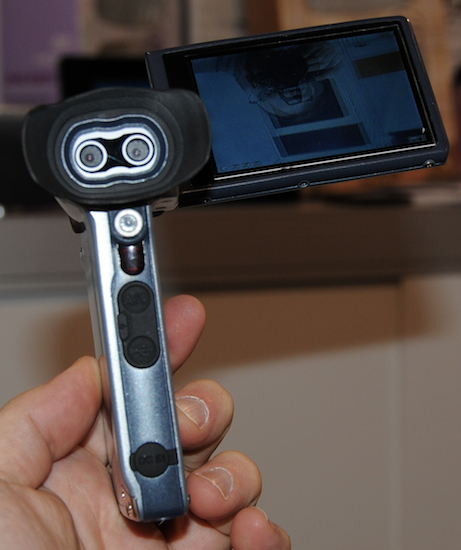 Samsung has announced a pair of new ergonomic camcorders called the SMX-C14 and the SMX-C10. 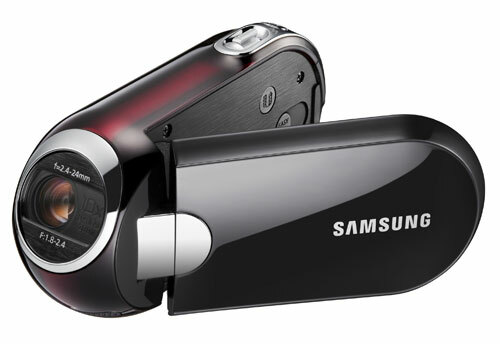 The two camcorders have the Touch of Color design that Samsung pioneered with its TVs. Both of the camcorders utilize Samsungs Active Angle Lens to make shooting video more comfortable.